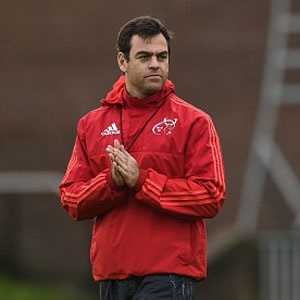 Cape Town - Munster Rugby have confirmed that former Springbok assistant coach Johann van Graan has extended his contract as head coach for a further two years and will remain with the club until June 2022. Leaving his role as Springboks forwards coach, Van Graan and his family made the move to Limerick in November 2017. "We are delighted Johann has committed his future to the province. There was a significant amount of interest from other clubs so it was always going to be a challenge to retain the services of a coach of Johann's calibre. However, Johann is fully committed to Munster Rugby and I believe it is a statement of intent from the province that we have finalised this deal," Munster Rugby Acting CEO Philip Quinn said. "Johann brought with him a wealth of experience and a track record with the­­­ Springboks and the Bulls in Super Rugby. He has put his own stamp on this squad over the past 18 months and has enhanced the Munster environment further. Working closely with his backroom staff he continues to drive the standards on and off the field, and we look forward to seeing the progress continue over the next three years." Van Graan added: "I am very happy and grateful to be in this position, knowing that I can continue to work with this incredible group of people and play my part in shaping Munster’s future. Coming to Munster I wanted to become part of the community, and every day I get to experience that sense of belonging with my family and I settling in from the very beginning.